Udaipur: Hindustan Zinc under its ‘Jeevan Tarang – Zinc Ke Sang’ Project has initiated around six month long Campaign – ‘Garv Se’ where these Special Children of God would be participating in series of creative activities to engage them with Hindustan Zinc employees & their families on a same platform. The program has been formally launched by Hindustan Zinc Ladies Club on 26th September, 2017 where Painting Workshop along with other artistic activities – clay modelling, diya painting & block painting were organized that saw the participation of around 60 children from Viklang Kalyan Samiti, Udaipur & Prayas Sansthan, Udaipur. The objective of the Campaign is to mainstream the specially abled children by bringing them together with the society/community and Garv Se has been a step towards it by engaging Hindustan Zinc employees and their families through the series of engagements – movie screening, sports, trekking, dance workshops to name a few. “Jeevan Tarang – Zinc Ke Sang” was formally launched on Foundation Day of Hindustan Zinc, i.e., on 10th January, 2017. 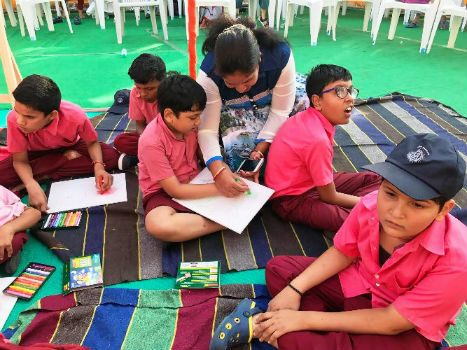 The fact says that there are over 70 million disabled people in India out of which over 12 million are hearing impaired with hardly 500 government aided Deaf schools providing formal education to these children. Even the teachers working in these schools are not equipped or trained to teach the hearing impaired students as Sign Language is still not accepted as a medium of teaching and communication. More than 90 % of students with deafness do not have access to and are out of the formal education system. Lack of access to language has also kept the deaf away from development of social and cognitive skills. ‘Jeevan Tarang’ endeavours to support people with disabilities, with a focus to identify needs of deaf-mute, visually impaired and children with brain damages. Around 500 beneficiaries have been identified from HZL’s operational areas; Kayad Mine, Rampura Agucha Mine, Chanderiya Smelting Complex and Udaipur. Access to knowledge is a basic and human right, a critical first step on the path to economic, educational, and social development. Hindustan Zinc has partnered with experts to build capacities of these institutions. Hindustan Zinc has also partnered with National Handicapped Finance & Development Corporation to support for Skill Building of the disabled persons from among Hindustan Zinc’s districts. Also present were Ms. Neelima Khetan – Head CSR, HZL, members of Hindustan Zinc Ladies Club along with HZl employees and their families during the program.